I finally received this yarn last week, and could hardly contain myself. It is lovely. It is soft, it is warm, and it could be a wonderful little pet. So, I set off to start knitting it up, and ran into my usual complaint. False starts....and the magic number was, once again, four. Although I tested the pattern out on an alpaca yarn I have knit with before, I have not knit with cashmere and this yarn is something like knitting with spider webs. It feels so delicate, and the best way to knit with it is to have a light touch. 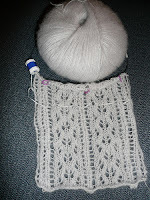 Otherwise, it is difficult to do knit 2 together and SSK, and it is almost impossible to unknit when you make a mistake. Anyway, I have finally got the hang of it and I am quite pleased with the progress. I also had to take some pressure off myself by telling Fabio that if he wasn't happy with the end result he was in no way obligated to take possession of the final product. He told me that he wouldn't of agreed to this little project if he didn't have confidence in my abilities....which I appreciated. I have knit things for people before, but I have never knit on commission (like an art piece). I was feeling a bit of self imposed pressure for a while, but I am getting into the grove of the pattern and my fears are melting away. Too bad you can't feel this stuff through the computer, it is divine. posted by shyknitter @ 8:26 p.m. It's *almost* as soft as mouse bellies... but nothing could be as soft as mouse bellies.